TS-700 - Preconfigured Functional Test Platform | Marvin Test Solutions, Inc. 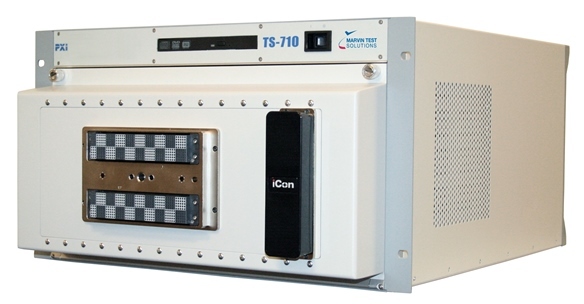 The TS-700 platform is a preconfigured, modular test platform that addresses a range of analog, digital, mixed-signal, and avionics test needs. Based on the GX7102A PXI platform, the TS-700 series of testers offers test engineers a preconfigured, compact, 3U/6U system which includes all of the required functionality needed to support the development of a functional test applications including a system self-test and a high pin count tester interface. When you receive your TS-700 system, it is “application ready” from day one - allowing you to focus on developing your application rather than developing the test system which means you will spend less time developing and deploying your application. Each TS-700 model can be customized for your specific application by incorporating over 10 different standard analog, digital, and communication test resources. The TS-700 platform is supplied ATEasy® software, which provides an integrated and complete test executive and test development environment, allowing users to quickly develop and easily maintain test applications. Each instrument or switch option includes a receiver / module cable as well as any necessary cables within the self test adapter to support the system self test. In addition, each instrument is supplied with plug & play drivers as well as an interactive UI for programming and control of each instrument. The GX-700 test system interface employs a unique design approach which allows customization of the system using any of the platform’s standard instrument options, without incurring the cost and design time typically associated with a customized functional test system. Each instrument option includes a receiver / module mating cable which makes it easy to configure or change the test system’s module configuration. The resulting benefit for the end user is a test system that is cost effective and easily configured for a specific application(s), using using off-the-shelf components and modules. In addition, an optional iCON interface connector can be installed, providing additional interconnects to other system resources within the PXI chassis or to external resources such as GPIB instrumentation. This connector can be configured for power, signal or coaxial connections - providing the user with a range of options for supporting additional types of instrumentation. Each TS-700 system is delivered with a system self test which includes an interactive self-test software procedure as well as a self-test adapter. The self-test verifies functional integrity of the system and resource connections to the test system interface. A range of TS-700 models are available with each model easily customized for a specific application by incorporating one or more of the standard TS-700 instrument options. Additionally, the platform can be futher customized by incorporating 3U or 6U PXI / cPCI modules. TS-710 Low cost, basic analog / digital functional test applications. TS-770 Analog and digital test support for LRU / SRU assemblies. ARINC 429 support. (4) 2 amp Form A relays, and (4) 2 amp Form C relays. Note: The iCON interface limits current capacity to 6 A for the GX6377 relay card. User Power GX7404, power interface and prototype card. Four switched, DC power outputs: +3.3 V, +5 V, +12 V, -12 V.
On-board prototyping area for custom circuitry. Digital I/O GX5733, 128 channel digital I/O card. 96 LVTTL digital channels. 32 bit configurable port accepts one GX5733 I/O module for customized input / output levels. TS-720 and the QuadPOD assembly is located external to the test system. Maximum data rate is 40 MHz. User Power GX7400A, dual channel, 300 W power supply. Digital I/O GX5292, 100 MHz, 32 channel digital I/O card. Optionally add up to 3 more cards. GX5733, 96 LVTTL static digital channels, 32 bit configurable port accepts one GX5733 I/O module for customized input / output levels. Digital I/O (2) GX5292, 100 MHz, 32 channel digital I/O cardS. Optionally add up to 2 more cards. User Power GX7400, dual channel, 300 W power supply.